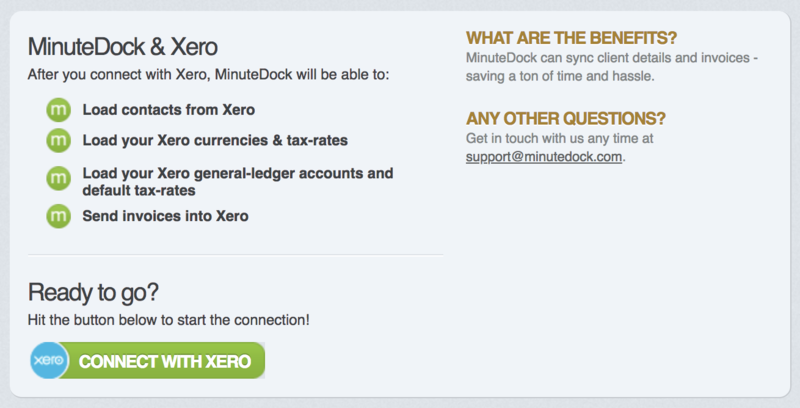 To connect MinuteDock to your Xero account, head to minutedock.com/integrations/xero or your account tab and click the ‘manage connections’ button. Select Xero and click on the ‘connect with Xero button’. Login with your Xero details and select the Xero account you want to connect with from the drop down. Clicking ‘authorise’ will connect the two accounts and redirect you back to MinuteDock. You can then manage your Xero connection under the account tab to import contacts and change invoicing options. You can also sync your account from here manually (MinuteDock will automatically sync overnight) by clicking the ‘sync now’ button.